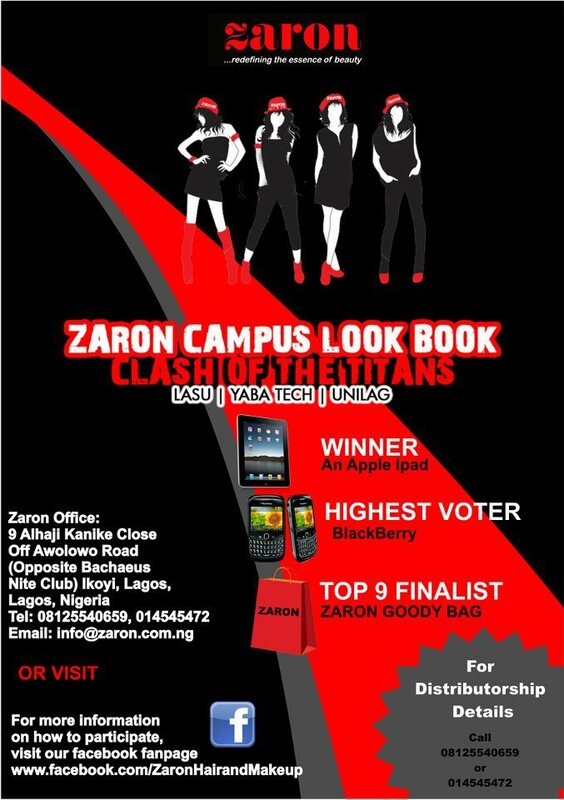 Zaron Cosmetics, a Hair and Makeup brand located in Ikoyi is having its first ever online competition called "The Zaron Campus Look Book" which is running from the 5th of March to the 30th of april 2012. ''The Clash of the Titans'' as the competition is tagged is between students from University of Lagos, Lagos State University, and Yaba College of Technology. The 10 girls with the highest votes get to be treated to glamorous make overs and a photo shoot courtesy Hakeem Salaam Photos (HSP) Images. There are loads of fantastic prices to be won, including an ipad, a blackberry and juicy Zaron Goody bags. Happy participating and may the strongest titan win.